200+ blogs have gotten together to host a Holiday Giveaway Blog Hop which will be taking part December 1-5! Each blog will be hosting their own giveaway. All blogs will be linked up so that our readers can easily hop through the blogs. The prizes are either cash (via PayPal) or gift cards. Gold Package– Sponsor a gift card $100 or more. Feature post about your product or company (300 words, 2 keyword links, pictures, links to your Social Media sites). Ad space for a whole month. Weekly Tweet about your company/product with link to your site. 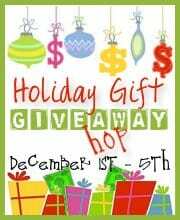 Link to your site on the Holiday Giveaway Blog Hop post. Silver Package– Sponsor a gift card of $50 to $99. 3 tweets about your company/product with link to your site. Bronze Package– Sponsor giftcard of $49 and under. 2 tweets about your company/product with link to your site. You are organized!! Good for you, I hope it goes well.